Enhanced with SuperNATURAL technology, the TD-11 V-Drums V-Compact Series brings a more natural and realistic playing experience to drummers of any skill level and budget. Affordable and easy to use, these new electronic kits are perfect for a variety of applications, including practice, teaching, recording, live performance, and more. 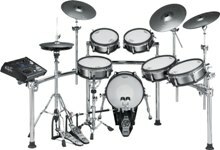 The groundbreaking TD-30 V-Drums kit was the first in history to offer SuperNATURAL sounds and Behavior Modeling. Today, the middle range of the V-Drums family inherits this acclaimed technology with the debut of the TD-15KV and TD-15K V-Tour kits. Drummers can now experience flagship SuperNATURAL performance, authenticity, and expression in a more affordable and compact format. Superb hi-hat expressiveness with VH-11 V-Hi-Hat? 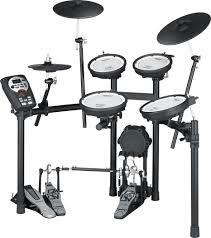 For over a decade, Roland’s revolutionary V-Drums? have lead the industry in expressive sound quality and incredible playability. 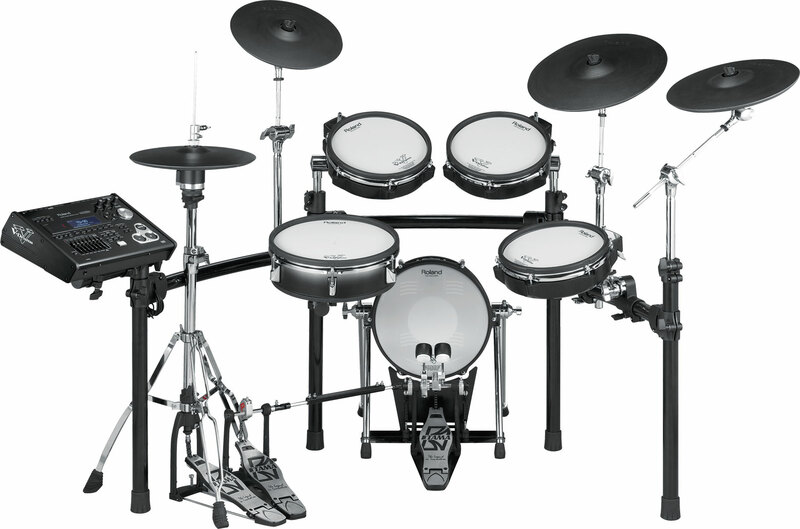 With the introduction of the SuperNATURAL?-powered TD-30K V-Pro Series, the electronic drum set reaches a new pinnacle in drumming performance. SuperNATURAL sounds with Behavior Modeling, along with advanced sensing technology, provides a new level of expressive sound quality and playability, resulting in an instrument that reacts and responds to all the subtleties, nuances, and dynamics of a drummer’s technique. In addition, USB audio-playback functionality has been added to expand the performance palette. For the stage or for professional recording, the new V-Pro is truly a complete and natural drumming experience. 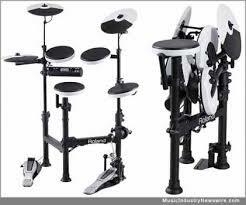 For over a decade, Roland’s revolutionary V-Drums? have lead the industry in expressive sound quality and incredible playability. 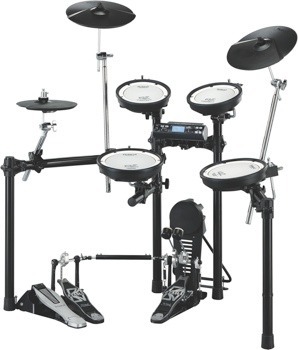 With the introduction of the SuperNATURAL?-powered TD-30KV V-Pro Series, the electronic drum set reaches a new pinnacle in drumming performance. SuperNATURAL sounds with Behavior Modeling, along with advanced sensing technology, provides a new level of expressive sound quality and playability, resulting in an instrument that reacts and responds to all the subtleties, nuances, and dynamics of a drummer’s technique. In addition, USB audio-playback functionality has been added to expand the performance palette. For the stage or for professional recording, the new V-Pro is truly a complete and natural drumming experience. 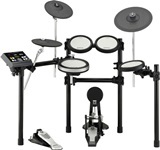 Featuring a small footprint and an innovative folding design for fast breakdown and easy transport/storage, the TD-4KP V-Drums Portable is the ultimate e-kit for mobile drumming and small spaces. The powerful TD-4 sound module is equipped with a wide range of expressive, editable sounds and essential practice features, while the integrated pads provide a satisfying feel and natural playability. 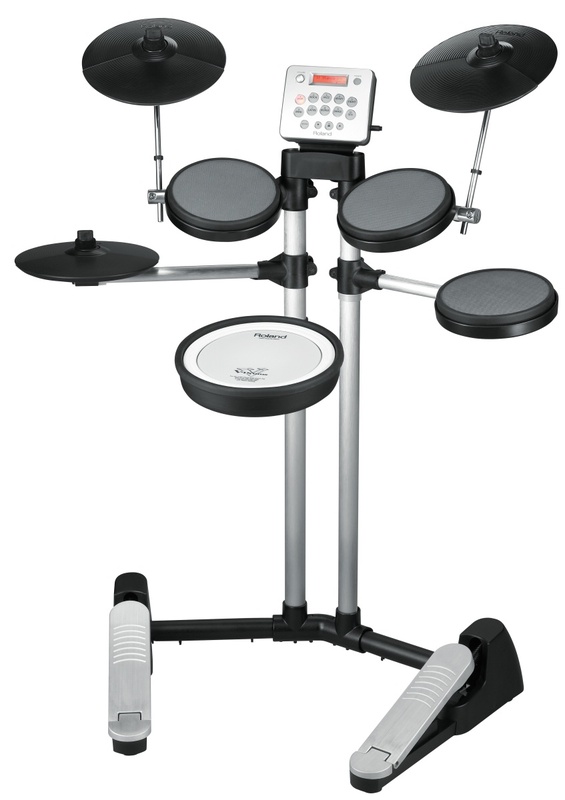 Perfect for small venues, rehearsals, lesson studios, bedrooms, apartments, and more, the TD-4KP combines V-Drums performance and features with impressive mobility and stow-away convenience. Designed for drummers at any age or skill level, the HD-3 is a great sounding, lightweight, compact, and affordable drum set that fits neatly and comfortably in any room. In addition to volume control via volume knob and/or headphones, the unique design of the HD-3 delivers ultra-quiet performance so family members and neighbors are not disturbed by the acoustic noise typically associated with drum sets. The size of the kit and design of the snare and toms provide a comfortable drumming experience. The new KU100 kick unit offers silent operation for the bass drum. Combine all this with large 10” cymbals and hi-hat and you get a great feeling drum kit that let you to play without disturbing others. The DTX400 trigger module has the highest quality sounds in its class, interactive training functions and built-in practice songs. Load new songs via USB, and upgrade and expand your kit as you develop your skills. 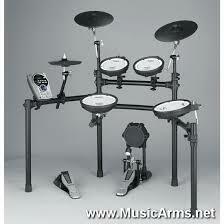 The DTX400K is perfect for anyone who wants to get into drumming. Because the DTX-PADs provide a feel close to that of acoustic drums they feel comfortable to play, help to improve your drumming technique, and integrate naturally into a hybrid acoustic-electronic kit. The DTX500 module has 427 drum, percussion and effect sounds for any musical situation and offers comprehensive training functions including Groove Check, practice songs, and easy MIDI recording. It is also a very capable MIDI controller for virtual drum instruments.